I was at a conference last year in September where one of the guest speakers was Henrik Lindberg, founder of Lindberg Eyewear. He gave a fascinating insight in to how Lindberg came to be so successful and synonymous with excellence. Lindberg launched its AIR Titanium frames in 1985 as a direct response to wanting to provide a truly innovative product that can be customised for each individual. Since then the collection has evolved and gone on to win several prestigious industry awards. Being a Lindberg stockist has been on our wish list for some time. But Lindberg have changed their strategy as to who gets this privilege, having been “hurt and promiscuous in the past” – their words, not mine! Since January we’ve been in a courtship process with Lindberg. They’re being understandably choosy and hard to get because they wanted their eyewear to receive the best treatment. By mid-April we had gained their seal of approval as they could see we were indeed looking to develop a long term relationship rather than a one-night stand. We spent a morning in April choosing our collection. The big delivery day finally arrived a few days ago. Each piece was carefully inspected, cleaned and put away into our designated Lindberg drawers ready to be displayed and paraded for our discerning clients. 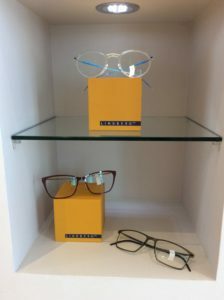 The collection is varied and beautiful and to do it justice you have see, feel and wear them – so why not pop into our practice to try on a pair?